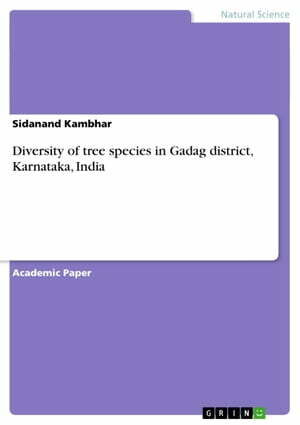 Collins Booksellers - Diversity of tree species in Gadag district, Karnataka, India by Sidanand Kambhar, 9783656831792. Buy this book online. Academic Paper from the year 2014 in the subject Biology - Botany, grade: 2, Kuvempu University, language: English, abstract: The present work aimed to study the tree species diversity in Gadag district, Karnataka. A total of 133 tree species belonging to 105 genera and 42 families were encountered. Fabaceae was represented by the highest number of species (34), followed by Bignoniaceae (10). Among total number of the species 16 plants recorded as alien and medicinal plants respectively, beside this edible fruit 22 (including minor 16 and major edible fruit 6), dye yielding 7, fodder 4, sacred plants 5, timber 21 also been documented. It is essential to document tree species diversity, in order to gain more knowledge on species richness as well as their geographical distribution.